Back of the Cereal Box: Make Way for the Moondancers! A reminder that not everything introduced into a long-running comic series becomes a permanent fixture. Nor does everything deserve to be. According to Wikipedia, the Moondancers — Crescent Moon, Harvest Moon and New Moon — are a trio of “radical pacifist terrorists.” The phrase seems like an oxymoron until you learn that they aim to destroy various manifestations of the military-industrial complex. And they begin do just this in their debut 1983 comic until Batman and Superman make them stop, at which point they are not seen or heard from again until a 1990 issue of Animal Man, which, as Obscure DC Characters notes, features the Moondancers as inhabitants of “comic book limbo.” Indeed. Nice knowing you, ladies! 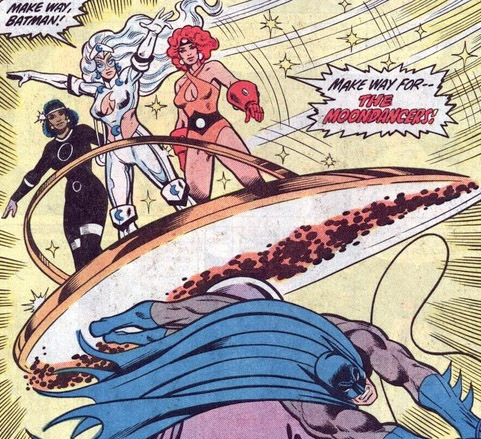 I’ll try not to find too much glee in the irony of a one-off team of 80s-glam wannabes making their debut by shouting “Make way for us!” and then promptly moving to the side so other, worthier characters can enjoy the spotlight.